I did finish The Hunger Games by Suzanne Collins the other day, my first Kindle book. 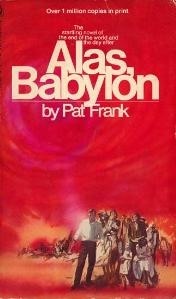 The novel was published in 2008 and is the first of a trilogy set in a kind of post-apocalyptic America (redubbed “Panem”) in which 12 “districts” are ruled by a totalitarian government (the “Capitol”). Little back story comes in this first book, so the reader just has to accept the premise in which Panem’s citizens must suffer unfair treatment from the Capitol, including an annual ritual in which two citizens from each district (one boy and one girl, aged 12-18) are made to fight in the brutal “hunger games” from which only one of the 24 participants can survive. 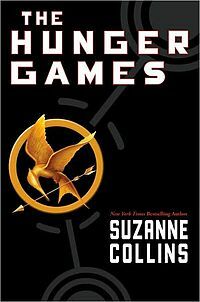 The book is told in the first person by the 16-year-old Katniss, the girl from District 12 who must fight in the games. The book and trilogy have been marketed as “young adult” fiction, and as I read I could tell I probably would’ve enjoyed it much more as a teen. As I mentioned a couple of weeks ago, a film adaptation is due soon (in March, I think), a lot of which was filmed in North Carolina last summer. Depending on the budget, I’m guessing the movie will be a CGI-laden action pic with a lot of good-looking young actors, and will probably be a hit. The story kind of plays off “Survivor” and other competition-based “reality” shows which feature an ensemble of players whom an audience follows for a few weeks until one emerges as the winner. The “hunger games” take place in an elaborate, controlled “arena” and are televised throughout Panem, and it seems like they become a kind of national focus as they play out. Kind of like the NFL playoffs or “American Idol” or the presidential campaign or... (fill in the blank). As I said in that earlier post, the lottery at the beginning of the book which determines who must fight in the games is pretty directly lifted from that famous Shirley Jackson short story from the 1940s. And while it has been many years since I’ve read Stephen King’s early novel The Long Walk (published in 1979 as by Richard Bachman), the story seems very similar to that one, too. Also reminds me of those Japanese Battle Royale movies more than a little. Anyhow, I’m bringing up The Hunger Games again here because I wanted to point out how the story reminded me in several ways of a multi-table poker tournament such as the World Series of Poker Main Event. I’ll try to list a few here without giving away too much plot. There are constant references in the book to the “Gamemakers” who might be likened to tournament officials and/or the director governing game play. 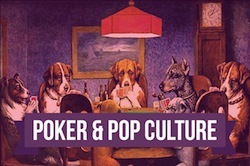 As in a poker tournament, the rules for the hunger games are significant, although the possibility for the Gamemakers in Collins’ novel to change the rules or introduce new ones as they go is a bit greater than is the case at the WSOP. 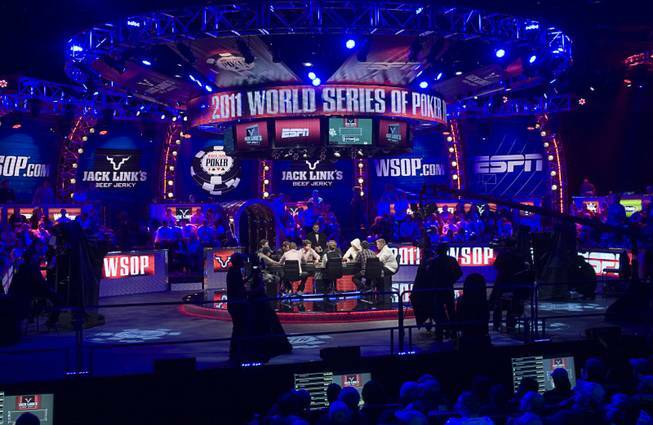 Like happens with the WSOP, non-players bet on the outcome according to constantly shifting odds. And as mentioned, viewers can follow all of the action at home. Once the field shrinks to less than a dozen, Katniss mentions how “they’ll be doing special features on each of us” for the viewing audience. While the hunger games are literally life-and-death for the characters, they seem mostly about creating a spectacle and retaining an audience. “From the Gamemakers’ point of view, this is the final word in entertainment,” explains Katniss at one point. There’s even a highlight show at the end, again reminding me of the way the WSOP Main Event has often been presented. “Condensing several weeks into three hours is quite a feat,” observes Katniss. Players collude with one another in the hunger games (something that is allowed more openly than in a poker tournament), their “alliances” sometimes recalling the online sponsorships that identify certain players as belonging to the same “pack.” And speaking of sponsorships, the players in the hunger games are also sponsored, with gifts provided to them as they fight (medicine, food, etc.) which could be said to create an unfair advantage for some. There are a few other analogies with poker tourneys and especially the WSOP ME I could draw, including the handsome, set-for-life reward due the winner. I’ll stop here, though, as it would be hard to explain further without dropping a few spoilers. While I can’t really say I was moved too terribly much by the book -- I don’t think I’m going to continue with the rest of the trilogy -- it was entertaining. And it might well appeal to poker players, especially those who play tourneys and thus perhaps might be inclined to like this sort of winner-take-all story. You mention young adult and teen, but I'm wondering if you think an 11 year old could handle it. He loves Star Wars, Harry Potter and Cryptid/Scary books, but we try to keep him sheltered to a degree. I might have to read it since its getting a ton of hype. I never read the potter series or saw the movies. Keep up the great writing! Check it out yourself and decide. Like I say, I probably would've dug it more as a teen (or younger). I'm actually trying to write a novel with a 12-year-old protagonist. It's a challenge to remember just what it was like then. I recommend the "39 Clues" series for your son. I just got Hunger Games for Christmas/Channukah. Haven't started reading yet because I'm determined to finish some other books first.